NOTE: About 50 percent of the population belongs to the Ovambo group and 9 percent to the Kavango group. Other ethnic groups include (with approximate share of total population) Herero 7 percent, Damara 7 percent, Nama 5 percent, Caprivian 4 percent, San or Khoikhoi 3 percent, Baster 2 percent, and Tswana 0.5 percent. 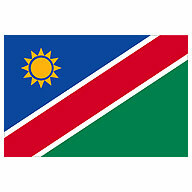 Although English is the official language, most Namibians speak at least one indigenous language at home. Afrikaans and German are also spoken.